Kaenon develops and distributes premium sunglasses to diversified specialty selling channels, premium Rx lenses and finished branded prescription sunglasses to the optical channel. Kaenon’s SR-91 lens provides the best optical performance in clarity, acuity and scratch resistance of any lightweight impact resistant lens available. After Kaenon’s initial years of operations it found itself in a position of having established strong brand quality recognition, with several high profile athletes (Danica Patrick, Davis Love) using their product because of quality superiority to other choices – without Kaenon paying them to wear the product – which is the norm in the business. In addition, Kaenon began selling though larger retail channels which required a heavier working capital investment. They needed growth capital. Synergy was able to identify and close with an internationally known consumer luxury brand company, Compagnie Financiere Richemont. 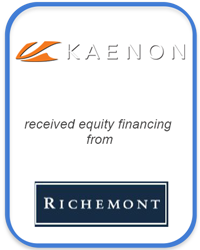 Synergy was successful in negotiating a non-control minority investment which enabled Kaenon to recapitalize and still maintain majority ownership.